This month’s Sugar High Friday is hosted by Delicious Days and the theme is canning. I enjoy canning fruit jellies and jams as well as hot pepper jelly, but this sweet pepper jelly has to be my favorite. It’s a little sweet and a little tart and has the consistency of honey, a nice combination. It makes a great party appetizer poured over a slab of cream cheese and served with wheat crackers or sliced toasted baguette, although I also enjoy it for breakfast or brunch on top of English muffins smeared with cream cheese. 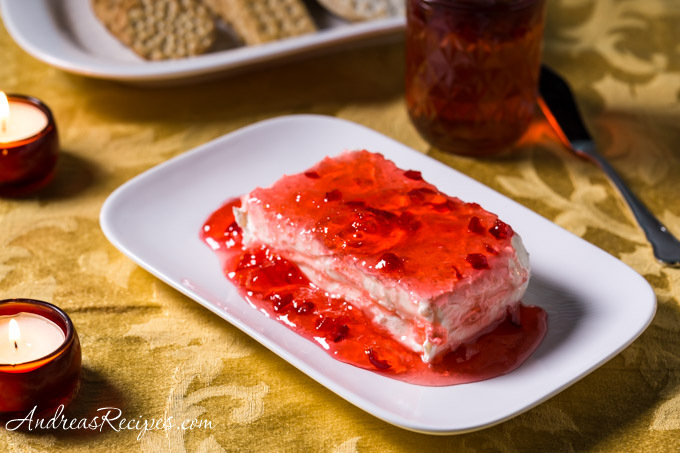 The color of the jelly will be a nice amber with red flakes, or if you prefer you can make it bright red by adding the optional food coloring. If this is your first experience with canning, then take the time to read about the boiling water canning method and check out the resources mentioned in the post, including the list of canning cookbooks. Update: Check out the round up of all this month’s canned sweets at Delicious Days. Add the bell pepper, vinegar, and sugar to the sauce pan. Bring to a rolling boil and cook for 6 minutes, stirring constantly. Stir in the liquid pectin and continue to boil for 3 more minutes, stirring constantly. Skim off the white foam with with the metal spoon, and remove the pan from the heat. Ladle the jelly into the sterilized jars, leaving a 1/2-inch head space. Insert the plastic spatula next to the glass and run it carefully around the edges to help remove any air bubbles. Wipe the rims clean. Seal and process in a boiling water canner for 5 minutes. Prep time and cook time do not include canning time. I love the color from the diced red bell pepper. It makes the jelly look so festive. I had tried a sample of red pepper jelly on the weekend and it tasted like there was oranges in it. It was very good. This is the only web site that I have found a recipe for it but to my surprize there is no oranges in it. Are there other recipes for red pepper jelly? Hi Kathleen: Of course there are many recipes out there for red pepper jelly, but I didn’t see any in my arsenal or in a quick Google search that had oranges in it. However, I think you could have an orange flavor in the jelly simply by adding the zest of one orange. That is simple enough and certainly worth a try. I have a recipe for Hot Pepper Jelly. A friend and I made it one weekend and it didn’t jell. We thought possibly we had too much liquid from the peppers. A week later I tried making it again draining at least 2 cups of the liquid from the peppers. Still, it didn’t jell. Another friend made some ( a different recipe) and she had the same outcome. Again, last night I attempted it again taking time and being extra careful to follow the directions carefully. Still it didn’t jell! What am I doing wrong?!?! I’ve canned for years so this is not new to me. But this recipe has me stumped. Suggestions? Hi Kathleen: Without seeing the recipe, I can only make a few guesses: not enough pectin, not enough sugar, or not enough cooking time for the mixture before canning. All that being said, some folks like their jellies to be a bit runny, so the recipe may be written that way. Again, I haven’t seen the recipe you are using, so I’m guessing at this point! Hi Kathleen: I have the same problem with my mulled apple cider jelly and have discovered that if I add an envelope of Knox unflavored gelatin, along with the pectin, the jelly actually gels. I don’t know if this will help with your hot pepper jelly, but it might be worth a shot. Thank you for the recipe. I got a similar recipe from a friend some years ago and lost it; I have been frantic. Finally come across yours and it was very similar. The others I found were all hot jelly’s. We put green and red bellpeppers together for a Christmas and everyone loves my little jelly gift bags. Thank you so much for helping me get back on track. Plus I recieved an extra; the last batch I made didn’t jell either, now I know why. Brenda: Glad you found a recipe you could use! I just made 2 separate batches of red pepper jelly the receipe is the same as yours except it called for 5 red peppers. Well, they must have been too big as it is runny as can be. Can I can this over again and do I need to add more pectin? Please help as these were supposed to be Christmas gifts. Yes, you could can it over again. You’ll have to recook the jelly and either add more sugar or more pectin, both of which aid in setting. Make sure you do the spoon test (jelly should drip off the spoon in sheets rather than drops) before canning. This recipe sounds great and I am anxious to try it, but I’m wondering if it can be frozen instead of canned. Once the red pepper jelly is opened, How long will it keep in the refrigerator? Have you tried to freeze the jelly in containers without canning in jars? Hi Catherine. For the best flavor, add the hot stuff during the cooking process. Stirring it in after opening a processed jar doesn’t hurt, but you won’t get quite as much flavor. 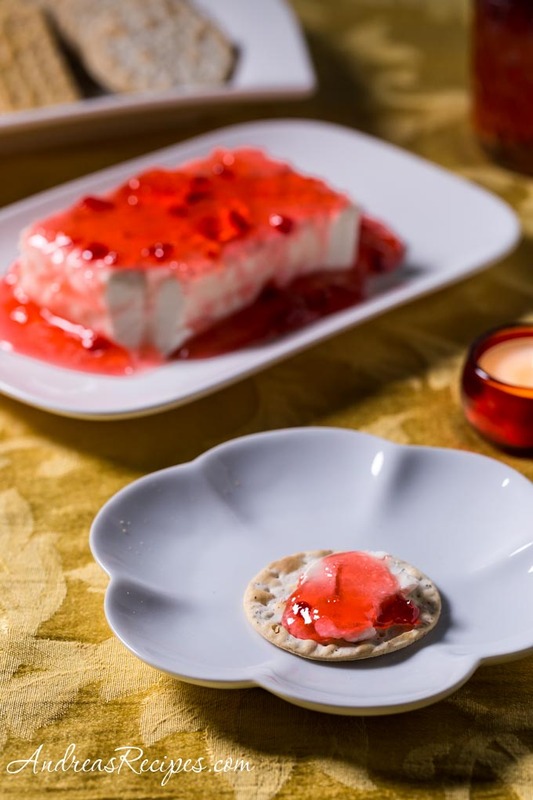 This Jelly is not supposed to set, it is supposed to be runny, you put some cream cheese on a plate, dump some red pepper jelly over it and serve it with Wheat Thins. Hello Andrea! Well I took it upon myself to make your “Sweet Red Pepper Jelly” (for the first time)…and it turned out beautifully! Really pleased with the results. Great consistency, colour and flavour. Alongside this jelly, I also made a “Sweet Red Pepper/Garlic Jelly” of which hosted with other jarred jams and other preserves, will be given as gifts this Christmas. Thanks for a great recipe. It’s printed ready to make for next season. hi I followed this recipe exactly and its been three days and my jelly has not set. I have made many jelly’s including hot pepper jelly and it set….I am wondering how to do a redo? Hi e. As I mentioned in the header notes, this recipe doesn’t set up like a traditional jelly, it has the consistency of honey. It spoons out and drizzles nicely. Hi Chris. Each Certo packet has 3 ounces, so you’ll need to measure out the liquid pectin. How long after you make the jelly do you have to store it before you can eat it? I’m way too eager to eat it! Hi Shannon. Once the jelly is set up, usually within 24 hours, it’s ready to eat. Enjoy! Hi there! Last year, money being in very short supply, I gave preserves as gifts at Christmas…7 different kinds. Your pepper jelly was the winner, by a big margin. Thanks so much for the recipe. I am planning to make an even bigger batch this year, and skip all the other kinds of jellies etc. Money is even shorter this year. If things keep on like this, next year I shall grow the peppers myself, and start with one leg up. Thanks again. I added garlic and hot peppers ! Its amazing!! my pepper jelly has turned to sugar, how can I repair it?